Innovation is never easy, regardless of its purpose. Whether you want to tackle a small glitch or a big problem, whether you try to achieve a local improvement or a global breakthrough, whether you are driven by an emerging customer demand or devoted to social progress writ large, you’ll always have a lot to take into account: needs and expectations, resource implications, rules and regulations, the state of the art as well as the technical limitations of legacy systems, and so on, and so forth. Wrestling with all these constraints can easily distract you from your ultimate goal. To help you find your innovation focus, I’ll revisit two conceptual maps I’ve discussed earlier, the innovation landscape and the Cynefin framework. The innovation landscape is aimed at characterizing different types of innovation. It stretches along two axes: problems and ideas for solutions. By splitting each axis into two sections (the known and the novel), you’ll find the four quadrants of the innovation landscape, or rather, four elementary types of innovation: routine, research, disruptive, and wicked. The second conceptual map, however, is not particularly tailored to the subject of innovation. With the Cynefin framework, Dave Snowden developed a generic tool to support decision-making and problem-solving. Looking at the characteristics of situations (demanding a decision) or problems (in need of a solution), he identified five domains: simple, complicated, complex, chaotic, and disorder. Overlaying these two types of maps will create a hybrid navigation aid tailored to decision-making in innovation endeavours. However, combining the best of both concepts won’t be as easy as simply looking for one-to-one matches between the quadrants of the innovation landscape and the domains of the Cynefin framework. The reality is slightly more challenging, and it’s worth the effort to walk through the arguments. Starting out from the different types of innovation, I’ll look for conducive organisational structures and processes and for suitable leadership styles that’ll help you devise and implement your innovation strategies. Situations of decision-making and problem-solving are characterised by degrees of predictability and uncertainty. 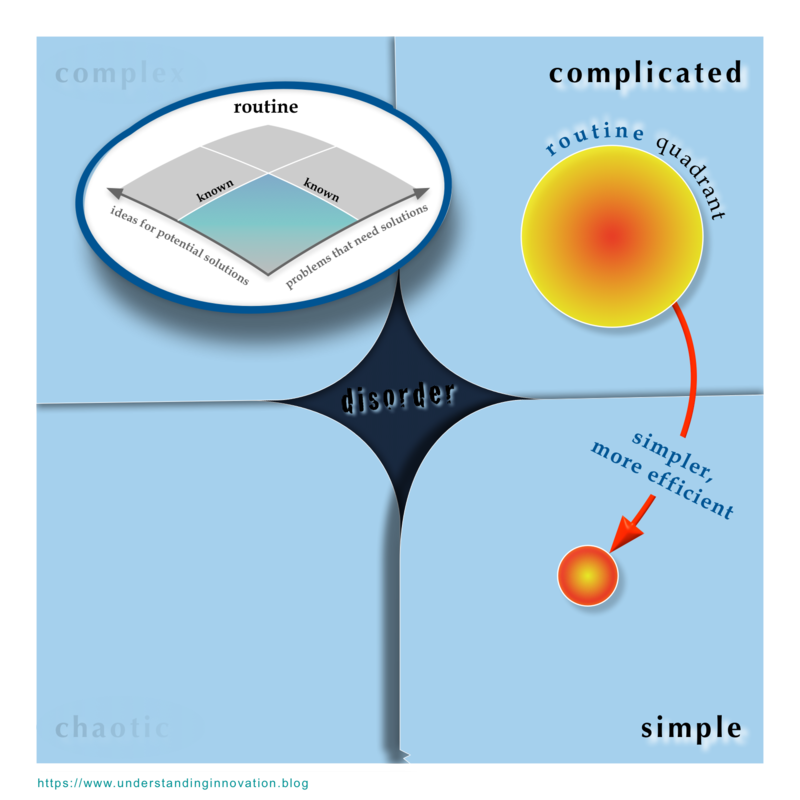 Accordingly, the Cynefin framework illustrates a significant difference between East and West: The simple and the complicated domains (that’s what I call ‘the East‘) are dominated by predictability, whereas the complex and the chaotic domains (‘the West‘) are marked by uncertainty. This difference of course has bearing on your innovation efforts as well. Let’s start with the routine quadrant of the innovation landscape, what I’ve called business as usual before. Such innovation delivers a novel combination of known ideas to solve a known problem (see inset), for example by taking a solution that worked somewhere else and employing it for your problem. The novelty is only in the match between problem and solution. This routine innovation, also known as efficiency innovation, is aimed at optimising goods and services, it is focused on making their production, distribution and delivery simpler, easier, faster, and cheaper. This is the corporate world of business and private gains. Innovation in the routine quadrant fits very well with the reality in the East of the Cynefin framework, with the characteristic predictability of the complicated and the simple domains. Efficiency innovation occurs in the complicated domain, intended to minimise the use of resources in production and delivery of goods and services. The clear hierarchies of stakeholders, the well-structured business processes, and the emphasis on precisely predetermining the next steps (a.k.a. planning) all support the objective of maximising efficiency. Successful efficiency innovation in the complicated domain is the driving force that moves an organisation towards the simple domain. However, the simple domain itself – the realm of standard operating procedures – is not a place for innovation to occur. The routine quadrant of the innovation landscape and the East of the Cynefin framework are a harmonious match. Efficiency innovation is the perfect tool for driving down the complication in producing proven goods and delivering known services, i.e., for reducing resource use and production cost per unit. All of these considerations occur within established companies with their decision hierarchies, business processes, planning tools, etc. That’s the easy harmony in predictability, where the future arrives gently in measured steps, where risk is minimised and efficiency is maximised. It’s fairly comfortable and convenient, and it’s comparatively easy. You’ll meet the extreme opposite in the wicked quadrant of the innovation landscape. There, innovation seeks to find novel ideas to solve yet unknown problems (see inset). With no sufficient knowledge of the problem space or the solution space, novelty is all over. For this type of often neglected innovation, there’s no routine: it’s all uncharted territory. This is the realm of public goods like global health care or the fight against climate change. This is the realm of market failures as no viable business models are known, yet. Hence, for the time being, the corporate world acts as free rider, waiting for societal investments to chart a viable path. Deep uncertainty is the hallmark of the wicked quadrant, the ‘not knowing enough‘ about root causes, about main effects and side effects, about influence factors that could shape the problem space or the solution space. 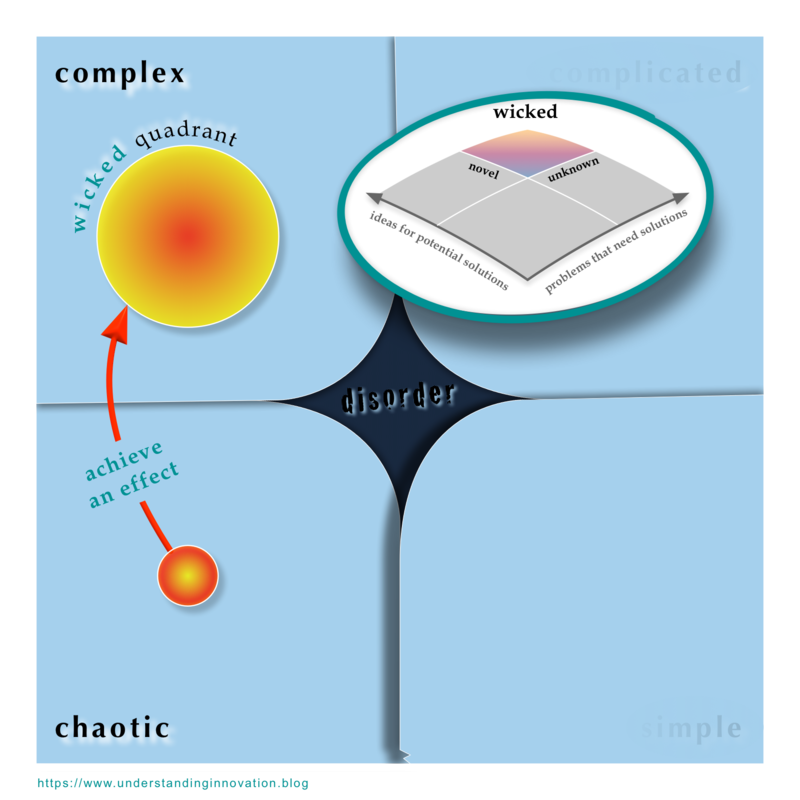 This reality makes the wicked quadrant an ideal match for the West of the Cynefin framework, i.e., the complex and the chaotic domains, which are equally characterised by uncertainty. Granted, little innovation in the chaotic domain will have a lasting impact; there’s too much fight for survival to allow for carefully thought-through problem-definitions and well-developed solutions. Still, some innovation does occur there, and that’s particularly relevant to achieve an immediate effect that moves your situation to the – a little more docile – complex domain. Innovation in the wicked quadrant is centred on the complex domain, focused on developing sufficient understanding of the complexities of both, the problems and the ideas for potential solutions. However, the scale of these problems, as well as the scale of their potential solutions, definitely exceed the scope and limitations of any established organisation. Simply put, they are bigger than any tool we’ve created so far. Hence we need to develop novel tools: forging novel ways of cooperation amongst existing entities, pooling resources across boundaries, and sourcing knowledge, skills, political attention, and not the least money from wherever possible. That is in perfect harmony with the approach most suitable in the West of the Cynefin framework: creating networks of the interested and influential, working with these stakeholders in gradually emerging processes, testing ideas and experimenting with potential solutions to mature a viable way forward. There are many names for this approach: trial and error, spiral development, ‘build a little, test a little‘, even the ironic ‘real-time mission planning‘. They all share the notion that there’s no perfect plan you could readily execute with guaranteed success; they all share the idea that you can only find your way by walking it one step at a time. Of course, the wicked quadrant is an area of major risks, and major failures are always a possible outcome. But the biggest failure is in not at all trying to solve those types of problems; for you cannot find a way if you don’t take a step forward. That’s the uneasy harmony in uncertainty. Here, very much in Alvin Toffler’s sense, ‘The future always comes too fast and in the wrong order‘: the future will leap-frog your assumptions, will jump at you from unexpected angles, will take you by surprise no matter how imaginative you are. No doubt that’s highly uncomfortable and deeply disconcerting. Still, that’s innovation under harmonious conditions: you can devise your approach to suit the specific conditions of uncertainty. Innovation in the routine and the wicked quadrants is clearly characterised by either predictability or uncertainty. Hence you can tailor your problem-solving approach to specific conditions: There’s no need to come to terms with the differences between East and West, no need to deal with the seeming paradoxes that engulf the transition between the complex and the complicated domains. These harmonious conditions simplify your innovation endeavour considerably, as you can rely on organisational structures, processes, and even cultures that are in themselves coherent, that support and reinforce each other, that work hand in hand, that act in harmony. In the research and the disruptive quadrants of the innovation landscape, you’ll have to face fundamentally different, and far more challenging, circumstances. For both of those, your problem-solving approach necessarily must incorporate elements from the East and the West of the Cynefin framework. For both, you’ll struggle to deal with predictability and uncertainty at the same time. That’ll be the topic of the upcoming post: innovation in dissonance. « Embrace the seeming paradox!